The Baltimore Colts, defending champions of the NFL, had a 3-1 record as they hosted the Green Bay Packers on October 25, 1959. Head Coach Weeb Ewbank’s team had a potent offense directed by QB Johnny Unitas, operating behind an outstanding line and with excellent receivers in ends Raymond Berry and Jim Mutscheller as well as HB Lenny Moore, who was frequently flanked out where his speed could be best utilized but was also an excellent runner from scrimmage. 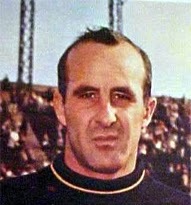 FB Alan “the Horse” Ameche provided power between the tackles. If there was concern with the defense, it was that age was beginning to wear it down, but players like DE Gino Marchetti and DT Gene “Big Daddy” Lipscomb were still of a high caliber. Green Bay, under new Head Coach Vince Lombardi, had won its first three games before losing badly to the Rams the previous week. QB Lamar McHan, a sixth-year veteran obtained from the Cardinals, performed well in the early going while HB Paul Hornung, who lacked speed but was versatile, was thriving in the new regime. After years of mediocrity, the Packers had the look of a rebuilding team with promise. There were 57,557 fervent fans in attendance at Memorial Stadium. They saw a scoreless first quarter, but Green Bay had the ball as the period wound down and went 79 yards in two plays to get on the board. On the first play of the second quarter, FB Lew Carpenter ran 55 yards off tackle for a touchdown, sliding on his stomach into the end zone. Paul Hornung added the extra point. The Colts responded with a 14-play, 80-yard drive. Lenny Moore had a 15-yard run and Unitas threw passes to Jim Mutscheller and Raymond Berry as well as Moore along the way. Unitas connected with Berry for an eight-yard TD to cap the series and Steve Myhra added the extra point to tie the score at 7-7. Not only did the Packers give up a touchdown, but they lost star safety Bobby Dillon to an injury that cost him the rest of the game and further hindered their efforts at pass defense. Baltimore advanced 79 yards in nine plays on its next series. Unitas again had throws to Berry and Moore, plus Alan Ameche, and rookie HB Alex Hawkins also ran effectively. Ameche ran the final three yards for a touchdown, Myhra again added the PAT, and the Colts took a 14-7 lead into halftime. The second half did not begin auspiciously for the Packers when DB Johnny Symank muffed the kickoff and LB Ray Nitschke recovered and ran it to his 12 yard line. But three plays into the third quarter, Lamar McHan connected with end Max McGee (pictured at left) for an 81-yard touchdown. With the successful extra point, the score was tied at 14-14. It proved to be the high water mark for Green Bay. The teams exchanged punts, and safety Johnny Sample of the Colts had a 25-yard return to the Green Bay 36. A pass interference penalty moved the ball to the 28 and, six plays later, Baltimore moved in front. Unitas passed for first downs to Moore and Berry and, after two carries by Ameche lost yardage, Unitas faked a handoff and threw to the fullback who was uncovered in the end zone for a three-yard TD. Myhra added the extra point. Two plays after the ensuing kickoff, McHan threw a short pass that was intercepted by LB Bill Pellington, and he returned it 30 yards for another Baltimore touchdown. Myhra converted again and the home team’s lead was up to 14 points. The Packers took the kickoff and again turned the ball over in short order, this time on the third play as McHan’s poorly-thrown pass beyond the reach of Paul Hornung was picked off by safety Ray Brown. Brown returned the interception 44 yards to the Green Bay 18. 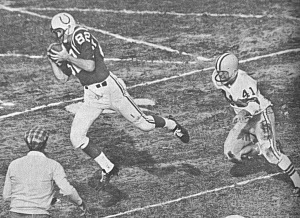 The Colts needed six plays to reach the end zone again as Unitas completed three passes to Berry, the last for a two-yard TD. In less than six minutes, the Colts had a 35-14 lead. Early in the fourth quarter, Baltimore nearly extended the lead when DHB Carl Taseff returned a punt 75 yards that was nullified by a clipping penalty. However, shortly thereafter “Big Daddy” Lipscomb recovered a fumble by McHan that was forced by Gino Marchetti and Baltimore padded its margin with a 43-yard Steve Myhra field goal. The Packers scored once more on a McHan pass to rookie end Boyd Dowler that covered four yards, finishing off an 80-yard series, but it was long after the game had been decided. Baltimore won handily by a final score of 38-21. Green Bay had the edge in total yards (344 to 309) while the Colts led in first downs (25 to 16). However, Baltimore recorded four sacks, to two by the Packers, and Green Bay turned the ball over six times, to devastating effect in the third quarter, while the Colts had two. 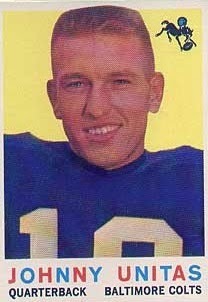 Johnny Unitas completed 19 of 29 passes for 206 yards and three touchdowns while giving up no interceptions. Raymond Berry (pictured below) had 10 catches for 117 yards and two TDs while Lenny Moore contributed four receptions for 41 yards in addition to 42 yards on 8 rushing attempts. For the Packers, Lamar McHan threw for two TDs, but was intercepted four times. Thanks to the long scoring catch, Max McGee gained 110 yards on his three receptions. The win kept the Colts in a tie for first in the Western Conference with the 49ers and, while they lost their next two games, they won the rest to again finish first with a 9-3 record. They defeated the Giants in the NFL Championship game for the second straight year. Green Bay lost its next three contests, marking five straight, before turning around and finishing the season with a four-game winning streak to end up at 7-5 and tied for third place in the conference with San Francisco. By the end, McHan had given way at quarterback to Bart Starr. While the Colts swept the season series with Green Bay and were clearly the superior team, in the next year the tide began to turn. Johnny Unitas set a new NFL record for touchdown passes with 32 while also leading the league in pass attempts (367), completions (193), and yards (2899). He received MVP as well as first-team All-NFL and Pro Bowl recognition. Also garnering first-team All-NFL and Pro Bowl honors were Raymond Berry, who led the league with 66 pass receptions for 959 yards and 14 TDs, and Lenny Moore, who had 47 catches for 846 yards and six scores and rushed for 422 yards and two more touchdowns on 92 carries for a third-ranked 1268 yards from scrimmage.